She now realizes how lucky she was and continues the fresh, from-scratch traditions at the restaurant. Wayne and Amy initially were running a successful personal chef and catering business in the area when they decided to expand after ten years. The small expansion they envisioned for food preparation turned into a full-service restaurant! The growth and reception have gone far beyond their anticipations! The idea for their restaurant was to provide a constantly evolving menu of fresh, quality cuisine with a focus on Eastern European foods rare to the area, such their golumpkis, and Polish sausage. Their Polish, which already had a loyal following when they opened the restaurant, is an authentic, garlic-based Polish sausage, prepared using the recipe that once belonged to Amy’s great-grandfather from Poland. In addition to continuing family traditions, they desired to make old-school sandwiches like the Cubana and Reuben in a way that distinguished them from others by making everything fresh, including roasting and preparing all of their meats in-house. I tried the Cubano and whatever they’re doing; they’re doing it right! It was tender with a nice flavor. Wayne is also very proud of the Reuben sandwich. What makes a good Reuben? Hmmm….I’ll have to try the Reuben next time. My husband loves Reubens. Vegetarians will find a nice variety of options on the menu as Wayne has been vegetarian for the past 27 years. 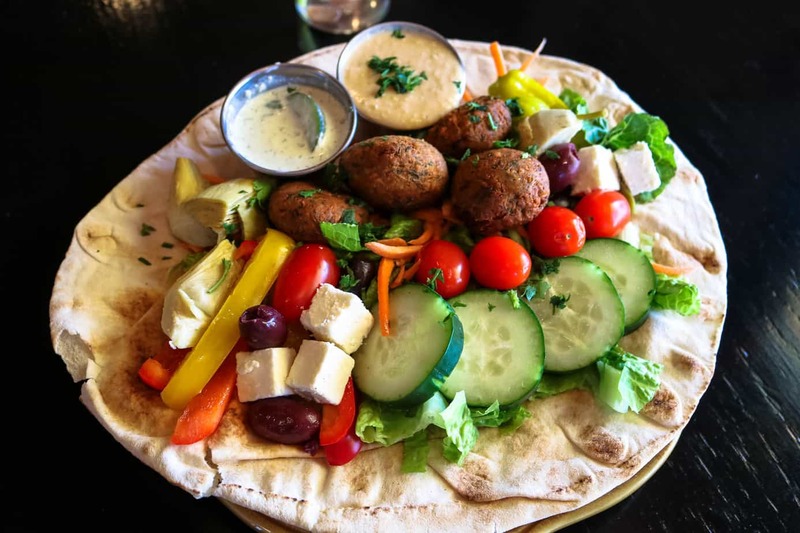 The falafel vegetarian hummus plate is fantastic! The dinner menu changes every week. Every Friday and Saturday there are an additional five special items on the menu, and at least one is vegetarian. When visiting on the weekends, you’re strongly admonished to try one of the specials. They consist of Amy’s creations from that which inspires her during the week or her cravings. She enjoys the challenge of producing meals from whatever ingredients she can get her hands on; it pushes her to persist in mastering her craft. I also learned during my visit that Wayne and Amy have a line of salsas and sauces that they sell in the restaurant as well as the local European Market. The sauces include marinara, pesto, barbecue, and hot sauce. Wayne makes all of the hot sauces for their line with hot peppers sourced locally. I remember my dad making homemade candy with us every Friday night. He always wanted to make his rock candy or peanut clusters. I wasn’t a fan of the rock candy (it tasted like rocks, lol) but I loved the peanut clusters and the thoughts still warm my heart. It’s amazing the feelings and thoughts that food stirs in us. It was a joy listening to Amy reminisce about preparing dishes with her family. Her recollections go back so far! She stated that as soon as she could turn a crank she was making Polish! How fortunate for us all that she’s sharing the heart and soul of her family with us in her delicious dishes. Hope you get a chance to stop by and taste for yourself! Tell me what you enjoyed about your visit in the comments!